Rails to Trails of Bedford County’s goal is to support the development, maintenance and promotion of the H&BT Rail Trail as a public resource offering a scenic year-round multi-use recreational trail; and especially to represent the interest of non-motorized trail users. Our mission is to preserve the heritage and historical significance of the H&BT Rail Trail. Rails to Trails of Bedford County is proud to offer you a special way to remember or honor a loved one through our memorial bench program. While you are able to suggest a preferred location, all bench placements are subject to approval by the Broad Top Township supervisors to make sure that they are in accordance with public need and the HB&T Rail Trail master site plan. We will make every effort to accommodate your preferences and will work together with you to find a location that is suitable for all involved. 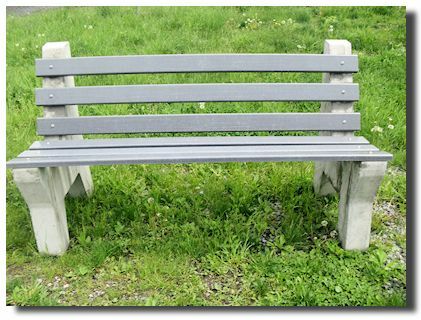 Our six foot benches will consist of concrete side forms with gray reinforced plastic seating and backs with a 3×12 inch black plaque. Cost of each bench will be $750. The cost includes the purchase and installation of the bench, as well as maintenance for the life of the bench. It also includes a plaque that will be affixed to the bench and can include up to three lines of text with 25 characters each. After looking over the accompanying application, please feel free to contact Dave Thomas at 814-928-5253 if you have any questions.